Dhaka, Sep 9 (Just News): Home minister Asaduzzaman Khan on Sunday told leaders of the Bangladesh Nationalist Party that the government would decide on the issue of providing treatment to the jailed party chairperson Begum Khaleda Zia after consulting the authorities concerned. 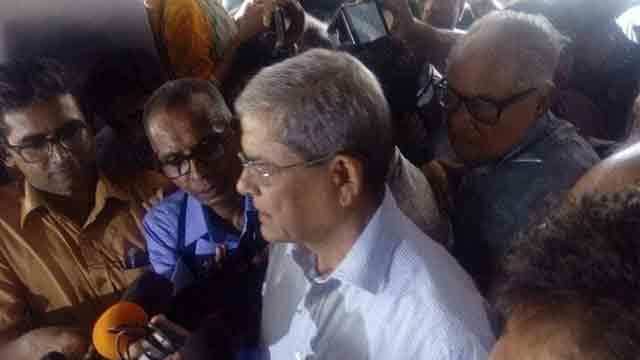 BNP secretary general Mirza Fakhrul Islam told reporters about the home minister’s stance after holding an hour-long meeting with him at his office at Bangladesh Secretariat. A seven-member delegation led by Fakhrul met home minister on the day and expressed their concern on the treatment of Khaleda Zia and her desire to get treatment at United Hospital. ‘We have told him that our chairperson needs improved treatment and she desires to get treatment at United Hospital and he told us that he will consult jail authorities and others concerned and then take the decision,’ Fakhrul told reporters after emerging from the meeting. ‘We hope that the government will ensure treatment of Khaleda Zia at United Hospital,’ he said. BNP senior leaders Jamiruddin Sircar, Khandaker Mosharraf Hossain, Nazrul Islam Khan, Rafiqul Islam Mia, Mirza Abbas, Abdul Moin Khan accompanied Fakhrul in the meeting.